One of the most celebrated and less travelled high altitude roads in India is the one that connects two northern most states- Himachal Pradesh and Jammu & Kashmir. It is none other than Manali Leh Road, a part of National Highway 21 (NH 21). Closed for most of the part of the year, when it opens, it opens the opportunity of unmatched coarse terrain adventure in the most unfriendly of the weather conditions. The bike would take road from Manali to Jipsa, covering many small villages and town finally reaching to Leh after crossing Sarchu. If wished, the bike trip could be extended to Nubra Valley and other nearby places before departing for Delhi. The features of the trip include never-before-seen culture and attachment of locals to their faith and way of life, however testing it may be. The bonus is the glimpses of wildlife and avifauna near the banks of rivers or lakes that are on this route. 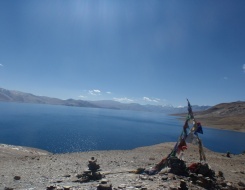 For newcomers on such a trip, the transition from Manali to Leh becomes a memorable aspect of their mental travelogue. Arrival at Manali by morning and then transfer to hotel. In the afternoon met our bike expert. He will assist you about the bikes and routes. Take a city tour by motor bike and get familiar with the bikes. Overnight stay at hotel. Early in the morning met Peak Adventure Tours Guide; briefing about the safari and then ride your bike towards Jispa via the Rohtang Pass. This high altitude road beyond the great Himalayan range connects the densely fertile and green Kullu valley to the stark barren region of Ladakh. The drive starts at Manali slowly winding up mountain roads till Rohtang Pass at 3,950M which connects the Kullu to the Lahaul valley. On entering the Lahaul valley we see a distinct change with the Hindu influence being replaced with the Buddhist religion. Continue drive to Jispa via Keylong. Packed lunch - enroute. 7-8 hours ride. Overnight stay at Tent/hotel. Leisurely ride over the scenic Baralacha Pass (4880 M). Plenty of stops to capture the scenic grandeur of this majestic landscape dotted with snow capped peaks and high altitude lakes. After crossing the pass drop down to the vast Sarchu plains. 6 hours ride. Dinner and overnight in tents. Early morning ride your bike to Leh gives you a feeling of being in the high Tibetan Plateau. One climbs a series of Galta loops consisting of 32 hairpin bends on the way up from Sarchu and come out in Pang valley. Cross to the other side of the Pang, Tzanspo River to continue drive up to yet another plateau for a long traverse on the legendary Moore plains. The highest of the Tibetan Plateau at 4200 Mts. Continue driving Tanglang La (5280 Mts.) the second highest motorable pass in the world that commands breath taking views of the Zanskar range. A pleasant drive about 20 Kms brings you to the Ladakhi hamlet, Gya, heralded by prayer flags. After crossing few more villages one reaches the great Indus River. Further ride to Leh town, over night at hotel. Leh: Leh is the fascinating capital of the Autonomous Hill Council of Ladakh, also known as Little Tibet. The important monasteries to visit in and around Leh are Shey, Thiksey, Hemis, Spituk, Shakar as well as the Shanti Stupa, Stok Palace and main Bazaar. The Leh palace dominating the town was the former home of the Namgyal Dynasty. The monastic festivals are very popular and Hemis, Phyang and Lamayuru festivals in summer are visited by lot of tourists who throng to see the Cham Dances. On this day you will go a sightseeing trip to some ancient monasteries in this area. Shey Gompa is about 15 kms from Leh. It used to be the summer palace of the kings of Ladakh. There are lots of Stupas and Gompas built around the palace. Shey palace was built by Deldan Namgyal in the beginning of 17Th century AD. Main attraction in Shey is the 12m Shakyamuni Buddha statue inside the Dresthang Gompa. Thiksey Gompa, close to Shey is about 17 kms from Leh. The monastery is considered to be one of the most beautiful in Ladakh and belongs to the Gelukspa order. Hemis, about 45 kms south of Leh it is one of the most famous and largest monastery in Ladakh. It belongs to the Drukpa order and was founded in the early 17Th century. The setting is perfect with the monastery cradled in a lovely valley, surrounded by streams and fronted by long Mani walls. Overnight stay at the guest house. • Accommodation: Hotel/guest house/camps according to itinerary on twin/double sharing basis. • Transport: AC Volvo coach from Delhi – Manali. Toyota Qualis/Tata sumo from Manali – Leh and also all sightseeing. •Royal Enfield 350 cc/500 cc. For extra days will be charges INR 1500 per day per bike. The fuel will be charged extra which will paid by the group. • Meal: At Guest house/hotel only breakfast will serve and rest of the places all meal will be provided. Meal will be mix of Indian, Chinese & continental. Cook will accompany the group. • Repair and Backup: For on the spot repairs our mechanic will carry necessary spare parts and tools.